Survivor: Redemption Island (2011) - 5th place, 16th out - 8th juror. Longevity totals: In-game - 34 days; Redemption Island - 3 days. Voted out in Episode 12, "You Mangled My Nets" (Day 32). Returned to the game and was voted out again in Episode 14, "Seems Like a No-Brainer" (Day 37). Survivor: Caramoan - Fans vs. Favorites (2013) - 7th place, 14th out - 5th juror. Voted out in Episode 12, "The Beginning of the End" (Day 33). Survivor: Game Changers (2017) - 8th place, 13th out - 6th juror. Voted out in Episode 13, "Parting Is Such Sweet Sorrow" (Day 33). Redemption Island Ep.1 RC/IC: "Push It Uphill" - Competes, and Ometepe loses. Redemption Island Ep.2 RC/IC: "Smash, Grab, Smash" - Smashes tiles for Ometepe, and again, Ometepe loses. Redemption Island Ep.3 RC/IC: "Spin Cycle" - One of Ometepe's wheel riders/spitters, and Ometepe 'wins' (Zapatera throws the challenge). 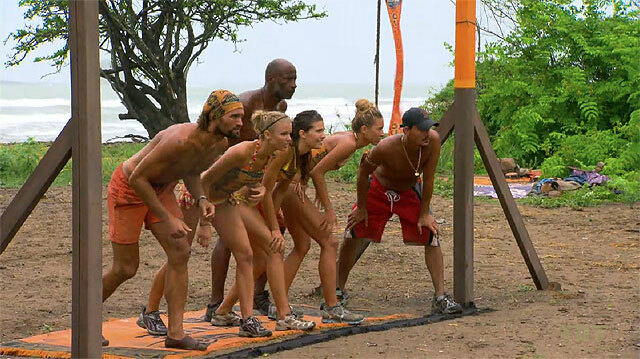 Redemption Island Ep.4 RC/IC: "Toolin' Around" - "Competes" but does nothing, Ometepe loses. Redemption Island Ep.5 RC/IC: "Smoko" - Blindfolded Andrea follows Rob's directions, Ometepe wins. Redemption Island Ep.6 RC/IC: "Beach Balls" - Catches no balls facing off against Julie, but Ometepe wins. Redemption Island Ep.7 RC/IC: "Crash Course" - Competes, Ometepe wins. Redemption Island Ep.8 IC: "Rollerballs" - First person out in the third (final) round (9th/12). Redemption Island Ep.9 (F11) IC: "Meso Soup" - Eliminated in the first (of three) rounds (bottom 5 of 11). Redemption Island Ep.9 (F10) IC: "Gang Hang" - After negotiating with Natalie and Andrea, wins immunity (1st/10). 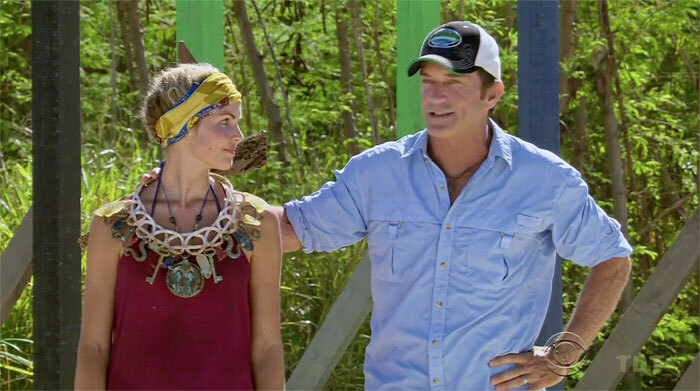 Redemption Island Ep.10 IC: "Mayan Pizza"- Makes it to final round, but Rob & Steve finish ahead of her (3rd/9). 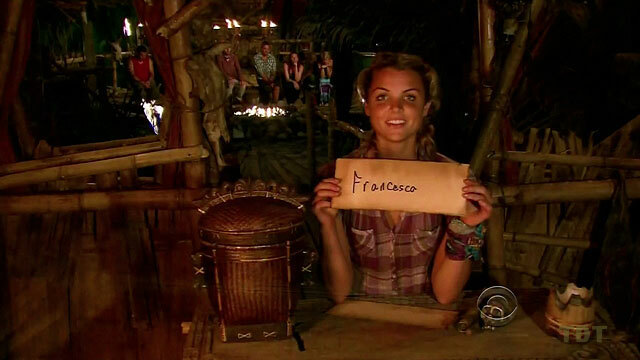 Redemption Island Ep.11 (F8) IC: "Log Jam" - Loses to Ashley in the first round (bottom 4/8). Redemption Island Ep.11 (F7) IC: "Memory" - Along with Grant, eliminated on the 5th card (tie-4th/7). Redemption Island Ep.12 IC: "Step On It"- Close, but behind Rob & Grant (3rd/6). 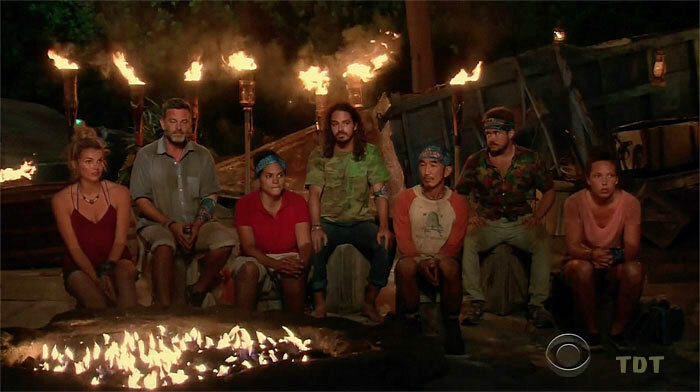 Redemption Island Ep.13 (F5) IC: "A Numbers Game" - Finishes behind Ashley & Rob (3rd/5). Redemption Island Ep.13 Duel: "A Maze N' Jig" - Third to finish, but stays alive (3rd*/4). Redemption Island Ep.14 Duel: "A Leg Up" - Wins, and returns to the game (1st/4). *Note: Non-elimination duels count as partial wins, in this case, third place as a quarter-win. Caramoan Ep.1 RC: "Water Slaughter" - With Brandon, wins the point against Hope & Eddie, and Bikal wins. Caramoan Ep.1 IC: "A Long Way to the Top" - With Cochran, tosses crates down from the first floor, but after Malcolm tosses, Bikal loses. Caramoan Ep.2 RC/IC: "Plunge, Pull & Pop" - With Brenda & Erik, one of three divers, and Bikal wins. Caramoan Ep. 3 RC/IC: "Cell Block Sea" - Competes, Bikal wins. Caramoan Ep. 4 RC: "Head and Shoulders" - With Brenda, one of the people carried, Bikal wins. Caramoan Ep. 4 IC: "Smash & Grab" - Smashes tiles for Bikal, Bikal wins, again. Caramoan Ep. 5 RC: "Nut Bucket" - Sits out (with Dawn & Erik), as Bikal wins. Caramoan Ep. 7 RC: "Hot Pursuit" - Competes, new Gota wins again. Caramoan Ep. 7 IC: "Phoenix Rises" - Opens locks, pulls the rope, Gota wins again. Caramoan Ep. 9 RC: "Jump Shot" - Part of the losing team (with Dawn, Malcolm, Phillip, Brenda). Caramoan Ep. 10 RC: "Muddy Waters" - Part of losing team (with Sherri, Malcolm, Brenda, Eddie). Caramoan Ep. 8 IC: "Caramoan Catering" - Makes it to second round, but not the 3rd or 4th (tie-4th/12). Caramoan Ep. 9 IC: "Last Gasp" - Good effort to stay in, but eventually loses in a tight battle with Brenda (2nd/11). Caramoan Ep. 10 IC: "Keel Hauling" - Makes it to the final (second) round, but ends behind Reynold and Malcolm (tie-3rd/10). Caramoan Ep. 11 IC: "Drop A Log" - Fifth person to drop out (5th/9). Caramoan Ep. 12 F8 RC/IC: "Bermuda Triangle" - Wins by a toe (on one foot) after 3 hours, over Brenda (1st/8). Caramoan Ep. 12 F7 IC: "Fun Climb" - Tied for last with Dawn and Sherri (tie - 5th/7). Game Changers Ep. 3 RC/IC: "Austin's EOC" - Crosses the obstacles for Tavua, who finish second (2nd*/3). Game Changers Ep. 4 IC: "Ow Pairs" - Retrieves bags, plates the winning ball, and Tavua wins (1st/3). Game Changers Ep. 5 RC: "Unchained Medley" - Crosses the beam holding the paddle, and Tavua wins (1st/3). Game Changers Ep. 5 IC: "Box Car Blues" - Carries sandbags across the beam; Tavua doesn't lose (2nd*/3). Game Changers Ep. 6 IC: "Cargo Salvage" - Now with Nuku, crosses barriers and hauls stuff, but Nuku loses. Game Changers Ep. 7 RC: "Dulcimer Stomp" - Runs around the maypole with Ozzy and Sarah, and Nuku wins. Game Changers Ep. 9 RC: "New School" - With Tai, hooks fish and carries the pole for the winning team. Game Changers Ep. 10 RC: "O Black Water" - Crosses water obstacles for the winning team. Game Changers Ep. 11 RC: "Angry Chair" - With Zeke & Brad, works the word puzzle for the winning team. Game Changers Ep. 8 IC: "Keep on Your Toes" - Outlasts everyone, over 25 minutes, Andrea wins! (1st/13). Game Changers Ep. 9 IC: "Get a Grip" - Second-to-last to drop out, at the 40-minute mark (3rd/12). Game Changers Ep. 11 IC: "High Step and Stack" - First to get her tiles lined up, and Andrea wins! (1st/10). Game Changers Ep. 12 IC: "Can't Buoy Me Love" - Third person to drop out, very quickly (7th/9). Game Changers Ep. 13 F8 IC: "Teeter Tower" - Comes close, drops her stack, does not beat Aubry (tie-2nd/9). Redemption Island, Ep. 12: Five votes, from Rob, Phillip, Natalie, Ashley, and Grant (voted out, 5-1). Redemption Island, Ep. 14 (F5 vote): Four votes, from Rob, Phillip, Natalie, and Ashley (voted out again, 4-1). Redemption Island, Ep. 14: Voted for Boston Rob Mariano (who won, 8-1-0). Caramoan, Ep. 12: Wins the clue to the idol in the F8 immunity challenge, which Erik finds for her and gives to her. Then she's blindsided with the idol in her pocket at the second Tribal Council that same episode. Caramoan, Ep. 1: Francesca Hogi (voted out, 6-4). Caramoan, Ep. 11: Malcolm Freberg (voted out, 3-3-3 [6-0-0]). Caramoan, Ep. 12: (F8 vote): Reynold Toepfer (voted out, 4-2-1-1). Caramoan, Ep. 1: Four votes, from Francesca, Brandon, Brenda, and Erik. Caramoan, Ep. 9: Three votes, from Reynold, Eddie, and Michael. Caramoan, Ep. 11: Three votes, from Reynold, Eddie, and Malcolm. Caramoan, Ep. 12 (F7 vote): Three votes, from Sherri, Erik, and Brenda (voted out, 3-2-2). Caramoan, Ep. 14: Voted for John Cochran (who won, 8-0-0). Game Changers, Ep. 6: Sandra Diaz-Twine (voted out, 5-2). Game Changers, Ep. 7: Jeff Varner (voted out, 6-0). Game Changers, Ep. 10: Five votes, from Brad, Debbie, Sierra, Tai, and Troyzan. Game Changers, Ep. 12: Three votes, from Brad, Sierra, and Troyzan. Game Changers, Ep. 13 (F8 vote): Six votes, from Brad, Cirie, Michaela, Sarah, Tai, and Troyzan (voted out, 6-2). RECORD: Andrea's 36 career votes against are an all-time record. Totally over Matt after seeing Krista give him her Bible. She swears. Wait, didn't you 'almost die' like this in HvsV, too? You guys are voting against me, now? Thanks. Stupid table maze with the sticking handle! Maybe this will be the start of an immunity run! In my day, the pre-jury people sat on the stage during the reunion show. Some of them even talked! Oh Brandon, you lovable brute! Here we come, ready or not! Wait, they could be targeting me now? Listening to Probst. No idea what kind of challenge this is. If only there were a hashtag to help us figure it out. Oh, yay. Malcolm just found an idol. Yeah, Malcolm. That's great. Really. Oh well, at least they all voted for Phillip. Auction time, something good is gonna happen now, right? Back at Tribal again, Ep11. Hoping Malcolm doesn't have an idol this time. Yup, no idols. Bye, Malcolm. Cheer up, Brenda. Nothing will ever come between us. Yes! I am NOT going home this episode, unless there's another immunity and tribal. Oh, Eddie. I know you'd never vote against me. Well, except two out of the last four times. Heading into Tribal Council with only a hidden idol. No problem, right? The stakes have been raised! Oh, you're fine, Troyzan. Don't worry. Sinking final ball on the table maze for the win! Pre-challenge lineup, Ep5 RC... Malcolm's gone! Maybe we need to keep an eye on Sarah? Rob Cesternino at RHAP (5/16/11): "Survivor: Redemption Island Andrea & Ashley"
Rob Cesternino at RHAP (9/15/11): "The South Pacific Premiere with Andrea Boehlke"
Gordon Holmes at XfinityTV.com (2/1/13): "We Can Stomp on (Fans') Dreams"
Rob Cesternino at RobHasAPodcast (5/2/13): "Talking With the Latest TWO Players Voted Off of Survivor - 5/02/13"
Gordon Holmes at XfinityTV.com (5/2/13): "Castaway Interview: Andrea Boehlke and Reynold Toepfer"
Josh Wigler at Parade.com (2/17/17): "Andrea Boehlke Meets the Press"
Gordon Holmes at XfinityTV.com (2/21/17): "Andrea: 'I Want to Be More Low-Key Aggressive'"
Dalton Ross at EW.com (5/18/17): "Andrea spills on what we didn't see on TV"
Josh Wigler at Parade.com (5/18/17): "Andrea Boehlke Addresses Her People"
Rob Cesternino at RHAP (5/18/17): "Exit Interviews | Latest Players Voted Out - 5/18/17"
Patrick Gomez at People.com (5/18/17): "Andrea Boehlke Dishes on that Devastating Blindside: 'I Need a Few Years to Recover'"
"Andrea may be only 21 years old, but she already has plenty of experience outdoors. 'I've been hunting and camping my whole life. I've shot seven deer and I've also hunted turkeys and lot of different kind of fowl.' And now she's hunting human game!!! But this natural flirt also hopes to kill with kindness. Does that mean a showmance could be in her future? 'There's really only three [hot] guys. Honestly, I think I've been checking out the girls more.' Alrighty then!" "Personal Claim to Fame: Paying for my own college education and making the Dean's list every semester. Why you think you'll 'survive' Survivor: Growing up on a farm and being a member of the 4-H club has made me both outdoorsy and resourceful. I'm also mentally tough and a bit of a social butterfly. I love being challenged and can handle the pressure.."
"Personal Claim to Fame: Moving to New York from Wisconsin on a whim and I’m still here! If You Could Have 3 Things on The Island What Would They Be and Why? 1) Yoga mat – It could serve as tarp/blanket/world’s shortest slip ‘n slide. 2) Juggling balls filled with rice – I’ve always wanted this. 3) A Unicorn, but not one that could fly. Survivor Contestant You Are Most Like: I guess I’m a smidge like Stephenie LaGrossa when it comes to being a force in challenges and being a bit of a tomboy." I'm confident in my challenge skills, so I know I'll be a great asset early on. After playing two seasons, I know how to work my social skills to form a solid group. My biggest hurdle will be to not come across as a schemer. In Caramoan, I was constantly on the chopping block for that reason, so I've been coming up with strategies to avoid that. I will have to play a low-key aggressive game. I definitely tried to overcorrect my Redemption Island game by playing very aggressively in Caramoan, but I think everyone could see I was trying to "make moves." I have to find some sort of balance between the two and also try to break away from my "us vs. them" old-fashioned way of playing the game. I have to be open to working with every single person."